The book promises to give you lots of valuable insight into life. Its simple and enlightening principles can be used by one and all, in the fast-paced world, which tends to find people falling short of time. The book's first paperback edition was published on 25th September, 2003. This book provides the perfect amalgam of eastern spirituality and western prosperity. Its principles have been followed by many well-known personalities, in various countries. Everyone loves a good fable, and this is certainly one. The protagonist is Julian Mantle, a high-profile attorney with a whacked-out schedule and a shameful set of spiritual priorities. Of course it takes a crisis (heart attack) to give Mantle pause. And pause he does--suddenly selling all his beloved possessions to trek India in pursuit of a meaningful existence. The Himalayan gurus along the way give simple advice, such as, "What lies behind you and what lies before you is nothing compared to what lies within you." Yet it is easy to forgive the story's simplicity because each kernel of wisdom is framed to address the persistent angst of Western white-collar professionals. Here is the story of Julian Mantle, a superstar lawyer whose out-of-balance lifestyle leads him to a near-fatal heart attack in a packed courtroom. His physical collapse brings him into a spiritual crisis that forces him to confront the condition of his life. Hoping to find happiness and fulfillment, he embarks upon an extraordinary odyssey to an ancient culture, where he discovers a powerful system to release the potential of his mind, body, and soul and learns to live with passion, purpose, and peace. Brilliantly blending ancient spiritual wisdom of the east with contemporary success principles of the West, this inspiring tale provides a step-by-step approach to living with greater courage, balance, abundance and joy. 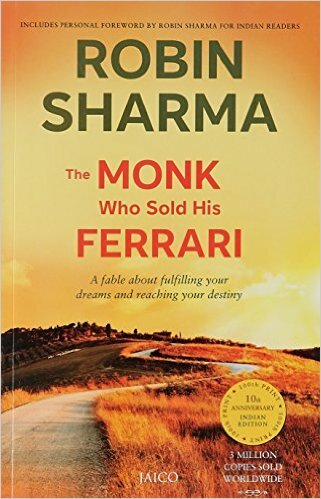 About the Author: Robin Sharma, who is the author of The Monk Who Sold His Ferrari, is one of the best-known experts in leadership. This book and a second book titled The Greatness Guide by Robin Sharma have been bestsellers, the world over and have been published in seventy languages as well. The principles in this book have been followed by many celebrities, across the globe. The author has also cofounded 960vets.com. He ranked in at the twelfth position in the list of International Professional Leadership Gurus, of the year 2012.